South Korean President Moon Jae-in and his North Korean counterpart, Kim Jong-un, kicked off their historic summit Tuesday in hopes of reviving the stalled denuclearization talks between the US and the communist state. The closed-door meeting began at the headquarters of the Central Committee of the Workers’ Party of Korea at 3:45 p.m., marking the first inter-Korean summit at the North’s ruling party building. 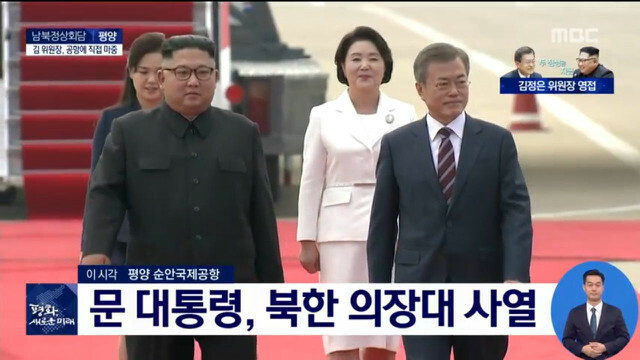 Accompanying Moon on the South Korean side was National Security Office chief Chung Eui-yong and National Intelligence Service chief Suh Hoon, while Kim was joined by his sister Kim Yo-jong and Kim Yong-chol, vice-chairman of the central committee of the North’s workers’ party. Among the items on the agenda were denuclearization, inter-Korean relations and ways to ease military tensions along the border. 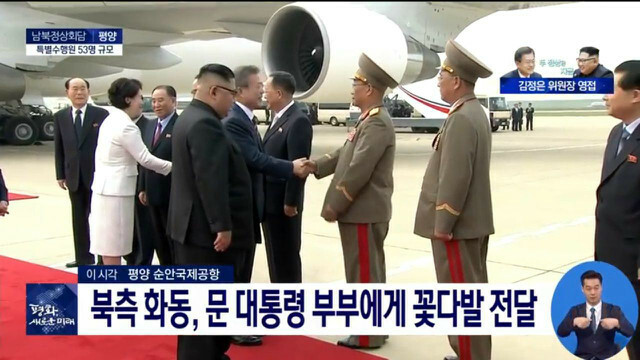 Meeting face-to-face for the first time since their previous summit on May 26, the two leaders vowed to achieve meaningful results at this meeting. Kim responded by saying that the people of North Korea were also yearning for a positive outcome. “I have felt that we (Moon and Kim) must produce substantial results, so as to not let the people of the North and the South down,” he said. Moon is expected to discuss the results of the summit with US President Donald Trump when they meet during the 73rd session of the UN General Assembly in New York this month, according to the president’s chief press secretary Yoon Young-chan. 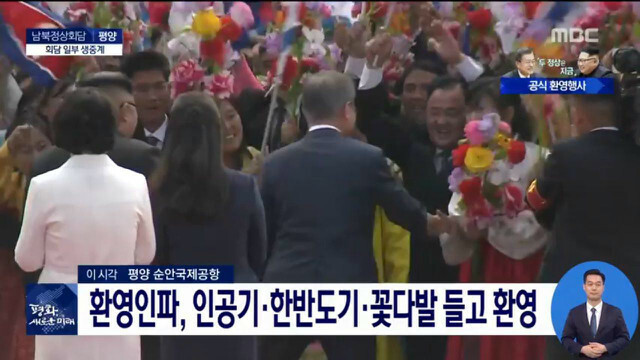 Following the summit, the South Korean first couple were treated to the Samjiyeon Orchestra’s performance at the Pyongyang Grand Theater, after which they and the entire entourage were to attend a welcome dinner at Mokran House. The first couple will stay at Paekhwawon, a state guesthouse reserved for the highest-priority VIPs. As the two leaders met for the first round of summit talks, the South Korean first lady visited Okryu Children's Hospital and Kim Won Gyun University of Music, and the civilian entourage held a meeting with Kim Yong-nam, North Korea’s nominal head of state. The South Korean businesspeople who traveled to Pyongyang as part of the delegation met with Ri Yong-nam, North Korea’s deputy prime minister for economic affairs. 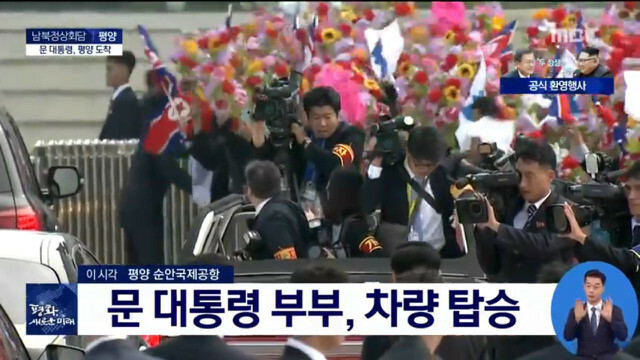 The two leaders will have at least one more meeting during Moon’s stay in Pyongyang. 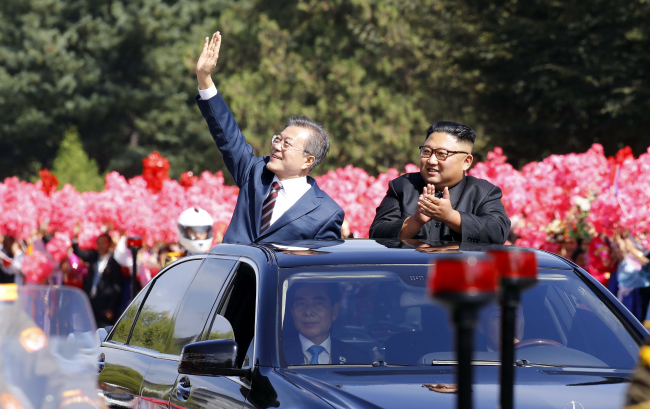 Prior to the visit, Moon had stated that his goal was not necessarily to sign a new agreement, but to establish “permanent peace” on the Korean Peninsula. “We are witnessing a transition from everyday fear of war to institutionalization of peace,” Moon was quoted as saying by his chief press secretary Yoon Young-chan. 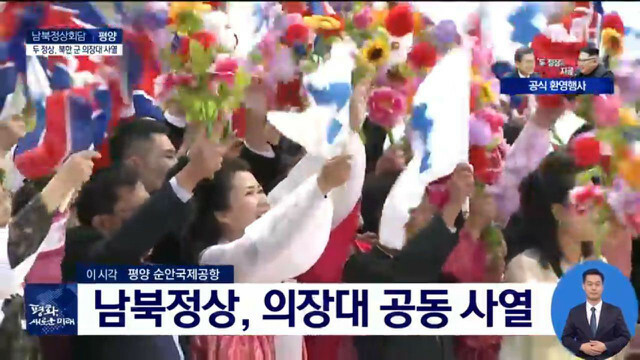 Kicking off the three-day visit, Moon and first lady Kim Jung-sook arrived at Pyongyang Sunan International Airport at around 10 a.m. and were greeted by North Korea’s Kim, his wife, Ri Sol-ju, and thunderous applause and cheers from a large crowd of North Koreans. 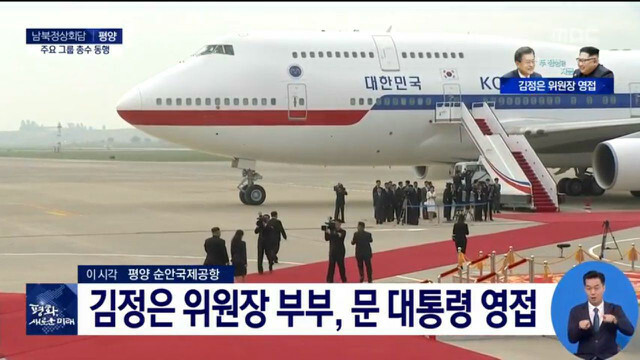 Moon is being accompanied by some 110 delegates consisting of government officials and a special entourage that included business tycoons, cultural figures and civic group leaders. 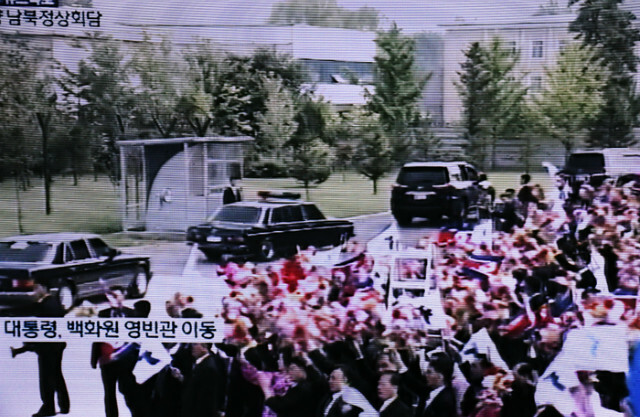 Chung Eui-yong, presidential economic adviser Kim Hyun-chul, Foreign Minister Kang Kyung-wha, Defense Minister Song Young-moo, Culture Minister Do Jong-whan and National Intelligence Service chief Suh Hoon are some of the government officials also visiting. Greeting the South Koreans at the airport were senior North Korean officials, including Kim Yo-jong, who is also vice director of the central committee of the North’s workers’ party and deputy chief of the ruling party’s propaganda and agitation department; Kim Yong-nam, Ri Son-gwon, chairman of North Korea’s Committee for the Peaceful Reunification of the Country; Choe Ryong-hae, vice chairman of North Korea’s workers’ party; and North Korean Foreign Minister Ri Yong-ho. The third inter-Korean summit is taking place as talks between the US and North Korea to denuclearize the Korean Peninsula have hit a roadblock. Last month, US President Donald Trump called off a scheduled trip to the North by US Secretary of State Mike Pompeo, citing “insufficient” progress on the denuclearization process. Since then, Kim reiterated his resolve for denuclearization in a meeting with Moon’s special envoy and top security adviser Chung Eui-yong earlier this month. According to Chung, Kim vowed to work with both Seoul and Washington to achieve denuclearization and to advance talks to ease military tensions along the inter-Korea border. He was even quoted as saying that he hoped the denuclearization process would be completed before Trump’s first four-year term ends in 2022. 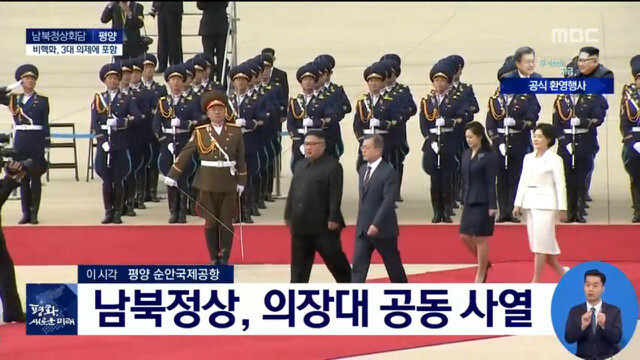 As a further gesture of goodwill, the North did not display its intercontinental ballistic missiles at a military parade in September to commemorate the 70th anniversary of the country, which Trump praised as a "big and very positive statement from North Korea." Prospects of a second meeting between Trump and Kim have been brewing in recent weeks, buoyed further by the White House receiving what Trump called a “very warm and positive” letter from the North Korean leader. Another item on the agenda at the Pyongyang summit, according to the Blue House, is clearing the way for Washington-Pyongyang talks. Despite the ongoing economic sanctions against the North by the international community, Moon was also to lay out bold economic initiatives involving Pyongyang. Due to the sanctions, however, a specific and substantive agreement is out of the question at the moment. 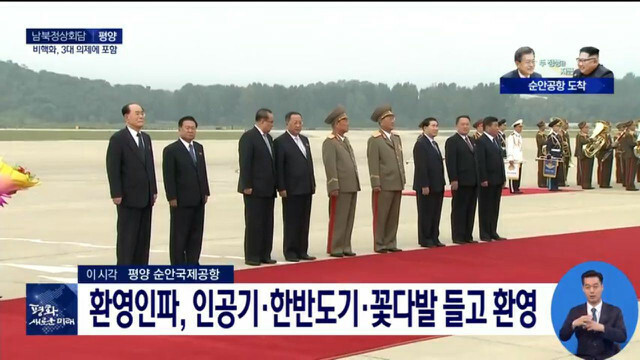 This marks the third inter-Korea summit since Moon took office last year. The two previous meetings were held April 27 and May 26 in the border village of Panmunjom. 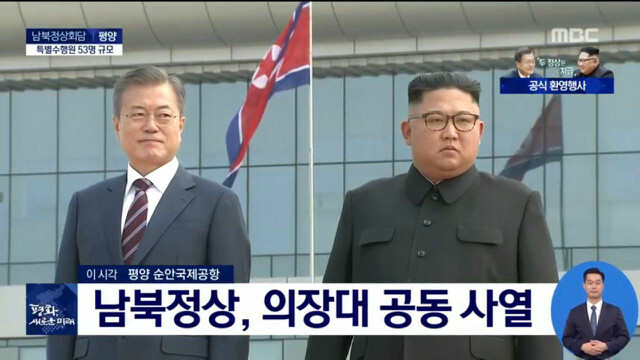 Moon is also the third South Korean president to have held a summit with a North Korean leader, with former presidents Kim Dae-jung and Roh Moo-hyun meeting in 2000 and 2007, respectively, with the late Kim Jong-il, Kim Jong-un’s father.